This remarkable register of African Americans in Caroline County, VA was recorded on the last few pages of a register of letters sent by the Bowling Green, VA Assistant Subassistant Commissioner of the Freedmen’s Bureau. The first two pages of the register are shown below. You can view the entire register on FamilySearch. 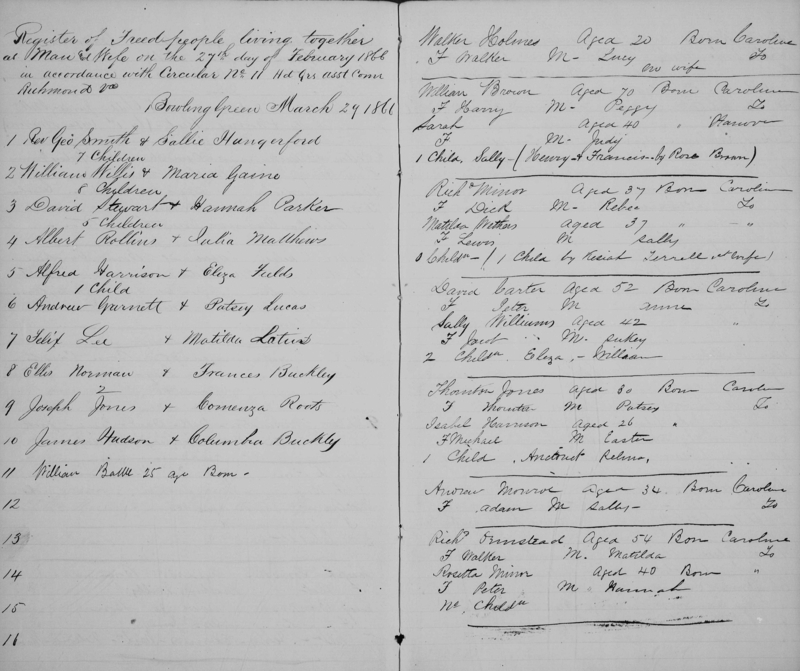 “Virginia, Freedmen’s Bureau Field Office Records, 1865-1872,” index and images, FamilySearch (https://familysearch.org/pal:/MM9.3.1/TH-266-11597-10348-9?cc=1596147&wc=9LMK-7M7:1078513402,1078512603 : accessed 30 December 2014), Bowling Green (Caroline County, assistant subassistant commissioner) > Roll 58, Letters sent, Nov 1866-Dec 1868 > image 85 of 92; citing NARA microfilm publication M1913, National Archives and Records Administration, College Park, Maryland.